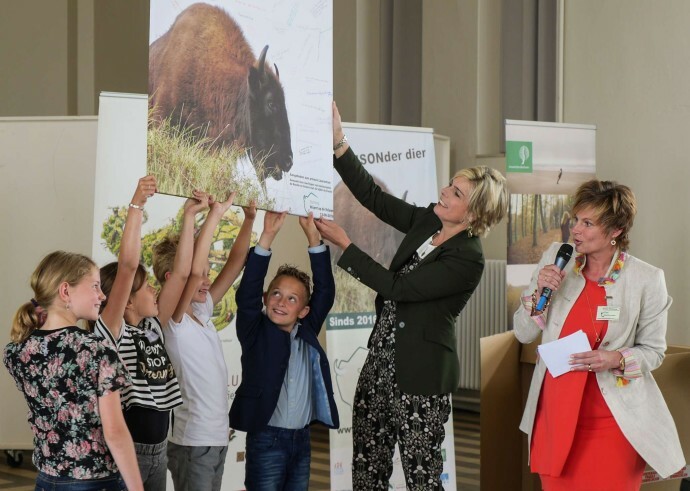 Princess Laurentien presenting the bison board with school children at the official opening of the European bison grazing project in Radio Kootwijk, Veluwe area. After the Kraansvlak (province of Noord-Holland) and the Maashorst (province of Noord-Brabant), the Veluwe (province of Gelderland) is the third bison reintroduction project in the Netherlands. The pilot grazing area is 400 hectares in size, and has the potential to be enlarged to a much wider area in the future. The first four bison that were brought here in April this year are all part of the European Wildlife Bank. Since their arrival, the animals have been adapting well to the area, and a first calf was born. However, for yet unknown reasons the bull unfortunately died quite soon after arrival. The animals and their impact on the landscape will be carefully monitored. Princess Laurentien has been a special advisor to Rewilding Europe since 2010. In December 2014 she joined the Rewilding Europe Circle, an assembly of ambassadors that champion and support our initiative in the widest sense possible. The Rewilding Europe Circle currently has nine members from different European countries and one member from the United States of America. The bison reintroduction project in the Veluwe area is an initiative of the foundation ‘Wisent op de Veluwe’, in partnership with the State Forest Service and ARK Nature. The bison is introduced to rewild the Veluwe area as an additional large herbivore species to support natural grazing as a key ecological process. It is also meant to support wildlife-based economic activities such as bison-watching through guided excursions. The Veluwe area, some 100,000 hectares in size, already holds good numbers of red and roe deer, wild boar, pine marten, badger and has an interesting birdlife, including the largest raven population in the country. A lot of nature bridges were built over the last decades to ensure connectivity between the different parts that are separated by roads and motorways. Bringing the European bison to this area is an important step towards a more diverse vegetation as the species opens up areas by its grazing, browsing, sand bathing and debarking of trees – thereby facilitating other species to benefit or colonize this wider variety of habitats. 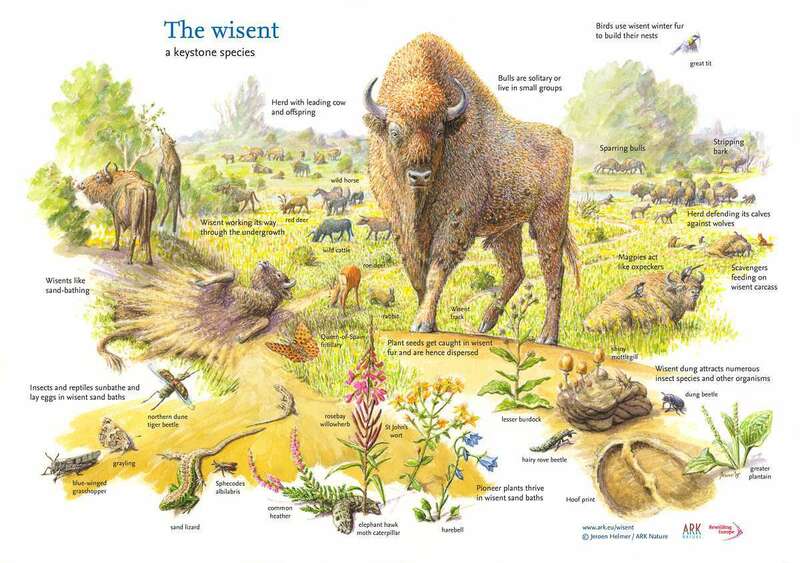 The European bison facilitates a rich biodiversity in European landscapes.